Where quick and frequent operation is essential use of quarter turn valves such as ball valves and plug valves must be considered. Gate valves can be broadly classified based on the disk design. Gate valves are available with variety of disks. With the exception of parallel disk gate valve which has parallel seats, all other types namely, solid wedge gate valve, flexible wedge gate valve and split wedge gate valve have inclined V-shaped seats like a wedge. The Wedge gate valve is the most commonly used valve. This valve may be installed in any position. Solid Wedge: Solid Wedge Disks are most commonly used because of simple and less expensive design. Split Wedge: Split Wedge gate valves are of ball and socket design. In a split wedge gate valve, the two disk halves are forced outward against the body seats by a spreader after the disk has been fully lowered into its seating position. 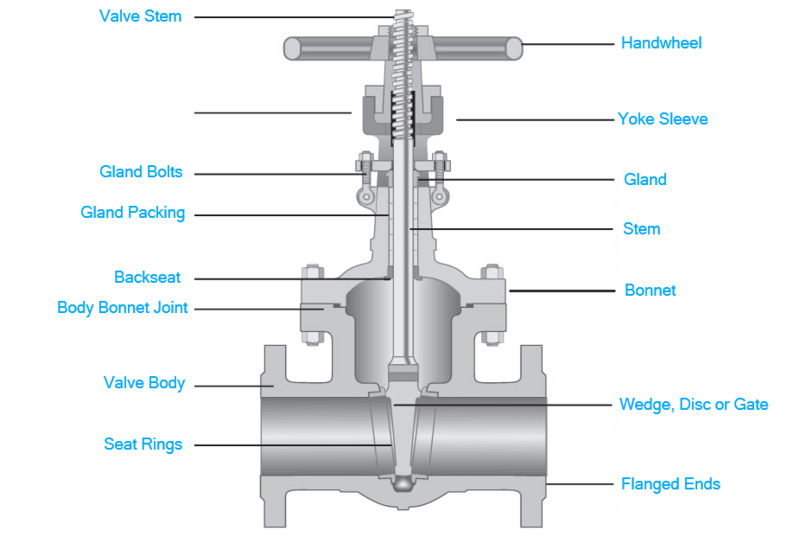 The following sketch illustrates the various parts of a Gate Valve. Renewable Seat Rings which can be either threaded or press fit into the body of the valve. This facilitates easy removal and replacement of seat rings. Non-Renewable Seat Rings which are seal welded or full welded to the body of the valve. Gate valves have good shut-off characteristics as the contact between the disk and seat ring extends over the entire circumference. The pressure drop across a gate valve is minimal as the disk offers no resistance to flow when the valve is in fully open position. Gate valves are bi-directional valves and can provide shut-off in either flow directions. Stem travel in gate valve requires multiple turns of the handwheel or gear operator and hence longer time duration to open or shut the valve. As the gate or wedge must travel across the entire cross-section of the valve bore, the overall height of gate valve is larger compared to a ball valve which is a quarter turn valve and does not require vertical movement of the stem. Gate valves are provided with renewable seats which are usually difficult to change out in-situ. The valve flow characteristics of gate valve can cause high velocity of flow to occur for longer duration while the opening or closing the valve due to slow movement of wedge or gate. High velocities can cause erosion of seat and the disc thereby reducing the design life of the valve. This condition is also referred to as “wire drawing” effect. Gate valves are susceptible to the solid wedge or disc getting stuck between the seats due to differential contraction between the valve seats and the wedge during shutdown of high temperature piping system. The piping system needs to be reheated for the disc to travel smoothly again. This makes the gate valve unsuitable for use in piping systems subject to high fluctuations in temperature. However, this problem can be overcome by using gate valve with flexible wedges. Solid wedge gate valves are sensitive to thermal expansion loads or bending moments which can cause the wedge or disc to lock between the valve seats or result in improper seating of wedge between the seats and leakage across the valve seats. Gate valves being metal seated do not provide bubble-tight shut-off and should not be used in applications where small leakage across the seats are not permissible. Solid wedge gate valves 40mm and below are generally specified to BS 5352. Solid wedge gate valves 2-inch and above are generally specified to BS-1414 or API-600 as appropriate. Compact Solid wedge gate valves 4-inch and below are specified to API-602. Split wedge gate valves 1-inch and above are specified to API-600. Conduit valves 2-inch and larger are specified to API-6D. Double disc gate valves 1-inch and larger are specified to API-6D or API-600 as appropriate.